I’m getting a little disillusioned about AWD and I find that with the considerable improvements in tires in recent years, vehicles with four-wheel drive do not have, on slippery surfaces, the advantage they demonstrated before. This became clear to me the other day in my hometown of Knowlton where a little snowfall had made the road rather slippery. Driving a propulsion Tesla P85+ equipped with Pirelli Soto Zero tires, I repeatedly pushed the vehicle to check the adherence level of this combination. Accelerator to the floor, the car kept a straight line while accelerating as if there was nothing to it. I’m willing to bet that from a standing start, comparison between a Tesla RWD and a Tesla AWD, would not result in a significant difference of time for 0 to 80 km/h. Over the past few years, we’ve witnessed an incredible rise in enthusiasm for AWD and I myself was of the ones promoting it. And dealers are now constantly whining for manufacturers to supply them with all-wheel drive vehicles. It’s a big sacrifice to make to lessen the pleasure of propulsion driving, even more so when the cost is high. It has also been proven time and again that AWD energy consumption is about 20% higher than a 2WD vehicle. Another point I want to emphasize is about high powered front-wheel drive vehicles that are unpleasant to drive, even dangerous, with that awful torque effect in the steering wheel. I’ve recently test driven a car that I’ve always had a soft spot for and whose V6 engine disappointed me, not for lack of performance or power, but by the marked effect on the front axle during acceleration. It felt like I was in one of those good old Saabs from fifteen years ago that darted left and right. All this to tell you to think twice before ordering an AWD that would be handy in 4 or 5 occasions but mostly useless the rest of the time. P.S. I equipped my Tesla with Dunlop tires and I admit that this was not one of the best decisions in my life. I am mainly critical of their dangerous response in puddles where hydroplaning is very present, if not dangerous. Jacques Duval (born on June 21, 1934 in Lévis, Quebec) is a journalist, columnist and former Quebec automobile racing driver. In 1952, he made his debut as a radio speaker at a Quebec radio station, and subsequently at a station in Verdun. He is best known as the founder of the 'Guide de l’auto' (Car Guide), of which he was editor in chief from 1967 to 2003. 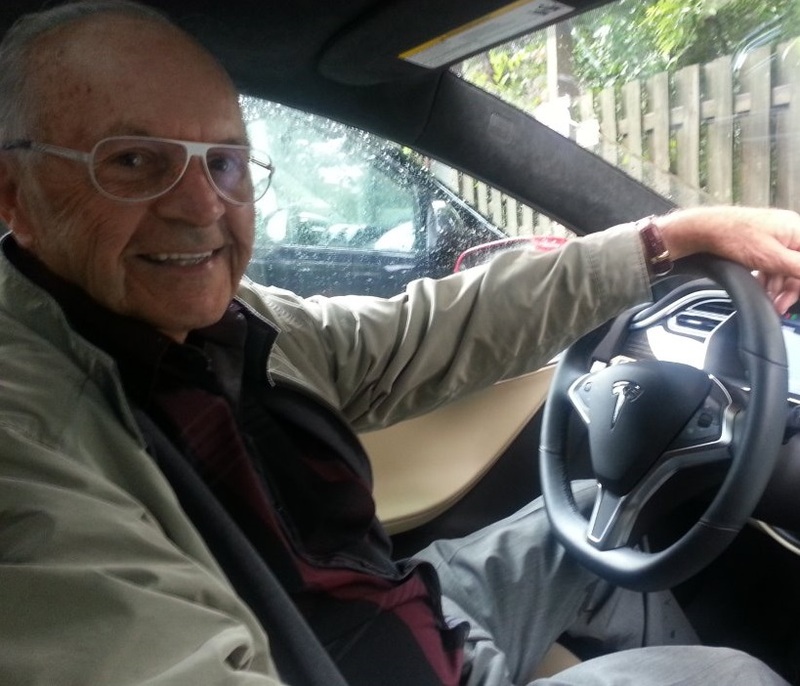 Today, Jacques Duval has twice proven his conviction in electric vehicles: he is indeed the owner of a TESLA MODEL S P85 and a CHEVY VOLT. AWD serves its purpose and a method of getting you out of a jamb on a slick service. It was never intended to improve the performance overall. AWD does not mean that 4 wheel power is always present. It means that it is available automatically when needed. For a EV is is easy to do as demonstrated on the Toyota Highlander Hybrid which has had this for a long time. The idea is simply to devote an electric motor to driving the back wheels when needed to get out of a jamb by detecting when the front wheels are slipping and then applying power to the rear wheels. It is not for drag racing. When not needed there should be no, or very little, impact to the power/mileage etc. of the vehicle. Depending on how the disconnection to the rear wheels is designed there may be a few moving parts that are still connected which could cause a hit or performance but when properly designed should be minimal.